Rated 5 out of 5 by jen505 from I like challenging TM games I'm always looking for a good TM game. I like when you can have to do levels multiple times to figure out "gold." I also like distinct achievements (rather than just getting gold on all levels, completing game, etc.). I found that this game had a lot of game play. It's a pretty "clicky" game but still good. Rated 5 out of 5 by Sami51 from Challenging & Fun! I have the 1st game and still play it a year later....so I was excited to see the new version! Very similar but a few new twists! The graphics and characters are pretty much the same...but there a few new "magic fountains"... and I believe I will be able to play this one for a year too becuase it is very challenging! Worth the $ !! 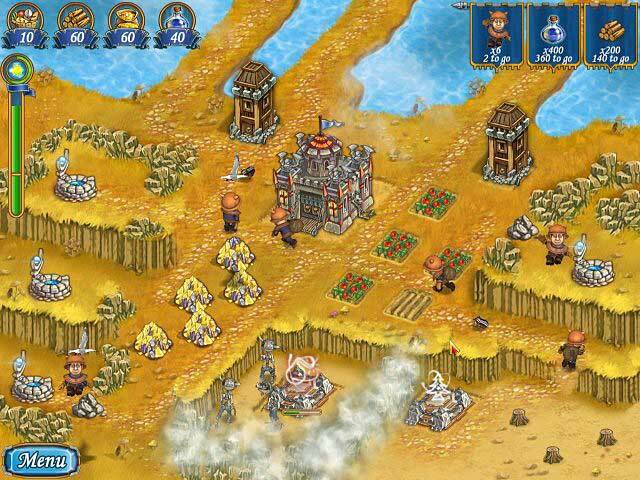 Rated 5 out of 5 by Tchrcook from Great Fun I miss the time management and strategy games. They are coming fewer and farther between as BFG is taken over by HOG's. This was a great story, took me a few tries to get gold at every level and was well worth the purchase. I loved the first one. This one seemed to be more challenging, but still achievable. Now, I'm trying to get all of the achievements. That is the real challenge! Rated 5 out of 5 by LanaPook from Great game!. I liked the first game and was excited to see a sequal! Thanks Big Fish! I would love to see more like this. Rated 5 out of 5 by Jezhara from A great TM game If you enjoyed KAC1 you will enjoy part 2. Its similar to KAC1 with resources to collect, things to build, etc. I found the graphics different on this one with the little builders/collectors seeming more close up and more 3D, very nice. Each level get harder and there are some real challenging levels as you progress in the game. Thoroughly enjoying it and hope there will be a part 3. Rated 5 out of 5 by Chicago00034 from New Yankee 2 LOVE LOVE LOVE IT!!!! So happy they finally came out with another TM instead of a HOG game for starters, an absolutely love part 2 of the New Yankee!!! Rated 5 out of 5 by mariekje71 from Strategy pur sang! WOW... this is a difficult one... playing levels all over to get the right sequenze! Love it!!!!!!! Rated 5 out of 5 by tinam23 from Time Managment at it's best! So many sequels coming out lately & I couldn't be happier with them! NYIKAC 2 is just as good as the 1st! The levels are super hard and there is so much going on! I love how they added cannons that shoot at you to shake things up a bit & the little fire's you need to tend too to keep the ghosts away. This series is going on my favorite's list & I am anxious & excited to see if we get a 3rd installment! Rated 5 out of 5 by Sante001 from King Arthur's Court 2 ... Great TM Game If you have enjoyed the first KAC, you will enjoy this one too. It moves fast, so get your fingers in shape before you start playing. The graphics are nicely done. Each level gets progressively more difficult, so this is a game that you will want to plan your strategy before you start the game. Enjoy! 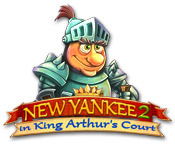 Rated 5 out of 5 by caz14 from New Yankee in King Arthur's Court 2 I love this type of game it helps to develop skills in planning moves and working out a strategy to complete. 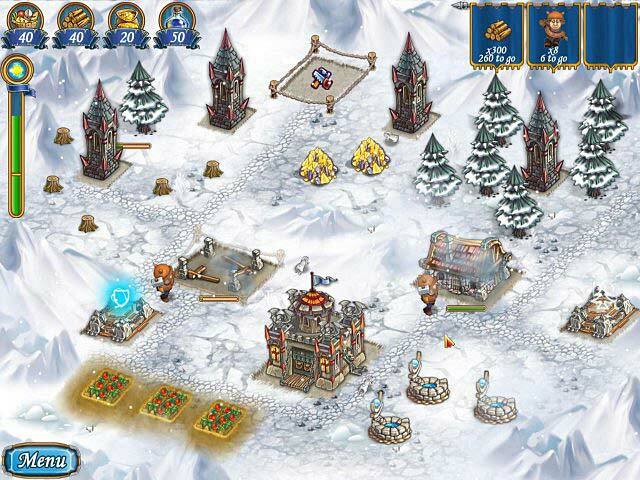 Rated 5 out of 5 by Redd4lfe1 from Everything a TM game should be New Yankee in King Arthur's Court is just what a time management game should be for seasoned players Each level contains new objectives, all levels get harder with no golds taken for granted. A very replayable game. You will get your money worth. Rated 4 out of 5 by khendrick1 from Great sequel to the series I really enjoyed this game. I wish there were more TM games like this. I do wish it was longer though. Rated 4 out of 5 by unicornone from great but not the greatest good TMGs are hard to come by and this just tips the scales in the right direction. Don't get me wrong, I enjoyed it and still am as I have not quite achieved gold in every level, so the game is lasting quite well. However if you are a speed freak then the game will end quite quickly as overall it is quite short. The map I found simplistic and not at all graphically pleasing, also I found the lack of level labelling made it difficult to tell one level from another in the map if you did not want to play sequentially. Some of the play is quite repetitive and slow but overall I enjoyed it .... a little more tweaking would have made all the difference though, so it is not quite in Roads of Rome class.... but ever so close. Rated 4 out of 5 by lugo007d from , Great TM game! I really enjoy the sequel to NYKAC. 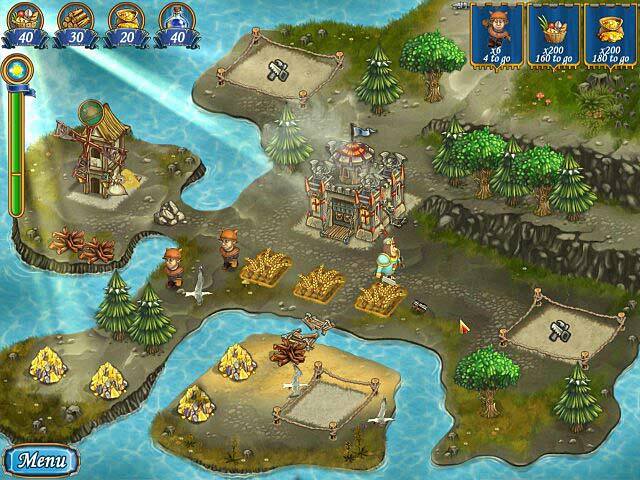 It has great graphics, interactive tasks, and the challenge keeps you returning to accomplish the gold. I am really happy I purchased the game. I gave it four stars due to the grammar and spelling errors causing a decrease in my overall rating. However, if you can bypass the errors you will have hours of fun. Rated 4 out of 5 by merbzy from Not bad It was fun. For some reason I found it very short, to short almost. Rated 4 out of 5 by jat3435 from Great TM game I am a TM player so I didn't find this game difficult, but it was worth the buy. TM games are harder to find, All HOG which I hate. I've gotten gold on all most all levels, this cute game has tons of replay potential. Rated 4 out of 5 by Cabbagepatcher from Details, details Yes, it's a fun little game, and has more going on than the first one which I also enjoyed. But oh dear, the lack of proof reading annoys me a lot. "Achievments", "promissed", "up their", just to name a few examples. The graphics were better; I noticed John has lost the tooth he used to have sticking up, and Mary looks considerably less cross-eyed. I felt that the story line was a bit unclear if you weren't familiar with the first one, and can someone please explain to me how Napoleon got in there, because I don't get it! Another annoyance I noticed; when queuing actions, if you have enough resources for say, one woodpile, it will let you select two and then cancel the second one when the worker starts on the first. All in all, it's fun, but some attention to detail would have improved it considerably. Rated 4 out of 5 by Beckylou from Fun game but rushed out = lots of errors I'm not an English teacher but really...don't rush games out so fast they are just jam packed with simple spelling errors. Like many others I am so sick of scary creepy HOG games that I was thrilled to find this sequel and am enjoying it so far. But I will say all the grammatical/spelling errors distract and make me feel it's not as high quality a game as it could be. More TM games please BF! Rated 4 out of 5 by CtrlAltDel from Um... can't think of one. First a bit about me. I do not are one bit about 'story line'. I just want to play a game, not read a story line. I also do not care about graphics, it's the game playing I'm after. I know I'm weird so I wanted to put that out there. This second version of New Yankee has more/different obstetrical to deal with while racing the clock. I think it's a fun little game. My two complaints are; 1. I often have to click several times on an object before it's selected. 2. It only took me two days to finish this game. Granted it's a low cost game but I sure would like a week worth of play for my money. For all the money I spend on entertainment, games are the highest cost per time of entertainment. I think I only missed 6 levels on getting gold the first time. I do like this series and already look forward to the next version as there are no where near enough TM games to keep me busy. Rated 4 out of 5 by Altmoabit from Finally!!! Wow, 2 TMGs in one day, what is going on? I guess that means no more for the rest of the year lol. It is a little bit different from the usual TMG, it still has you collecting resources and build houses etc. but a little spell makes all the trees grow back that you had to chop down. Little ice witches come onto the screen and must be chased away by the frealess yankee knight and little fires that the workers light. The graphics make it different and there seems to be more interaction going on, lots of things happening on one screen. Music is pleasant, so I bought it. Is it my favorite one? No, but I find the lack of TMG disturbing....so I am glad even for the ones that are not the best in my opinion. I soon will be playing old TMG from 2 years ago again as I have been doing lately. Rated 3 out of 5 by megwoman25 from Review Of Completed Game... I did enjoy this game and it did chew up a few hours of my time but I can't say this series is a favorite of mine. I do like that this game involves real strategy not just random clicking as you don't always need to clear everything to get gold. This game makes you use your thinking cap and I quite like that but that being said this is a game that I am unable to get gold on many levels due to that out of the box thinking. I can go back and do a lot of them but the day to night ones are really challenging especially if you need the wood for other things. In fact this is the only TM I have ever played that there is only one way to win and if you do not do it in that fashion, you will have to start over the level because you won't have the items needed to get any medal let alone gold. You get stuck and can't even finish the level if you do the wrong path. So I like the thinking part but most of these games have different ways you can complete the same tasks and this game does not therefore it annoys me. I try for gold a second, third & 4th time but don't always get all the golds and I am okay with that and I am a person who will play a game til I get gold no matter how long I am playing levels over and over again. This game has 40 levels of various difficulties. Obviously it gets harder as the game goes on. Some levels are overly easy and others are very taxing on the brain and not in a good way. I also wish there were power ups of some kind to help you and not just the ones you get from having collected mana but other helpful ones like being able to freeze time for 20 seconds or being able to banish all baddies for a period of time. There are just some things missing that could make this game excellent instead of just average. Overall though like I said in the first paragraph, it chewed up a few hours of my time and I did enjoy the thinking of it. Its just nowadays there are so many other builder TMs that are made so much better that I can see how this one would just get looked over due to it not having the extras that could really make it special. However one positive is that all of these games are very humorous as the writing is very well done between the characters. Rated 3 out of 5 by Annier35 from Too short! This game didn't really get progressively more challenging like most TM games do. It played very quickly, and I think there were only 2 levels I didn't get gold on the first time around. And that was probably only because I was also watching TV while playing those levels. Fun, but disappointing. Should have an "expert" series of levels once you complete all of the levels! Rated 3 out of 5 by Developer_Gamer from Nothing especial. Every level is just the same. Nice characters. Strange enemies. And tank? It's a joke? Rated 3 out of 5 by tymemgmtQueen from Not impressed I am disappointed with this game. I am a time management game lover and this one just doesn't do it for me. The workers are slow, there are no bonuses, no casual mode, and overall the storyline is silly. Rated 3 out of 5 by NCwriter from Fun, but some irritating differences from the first one I liked the first New Yankee game quite a bit, and this one is pretty much the same theme, same goals, etc. Graphics are still good, but I agree with other reviewers who complained about the grammar problems and the cursor sometimes not registering a click correctly. But the one thing that bugged me more than those things is that when a level begins, you can't see the goals and resources at the top of the screen until you click away the last piece of dialogue. So there's no way to plan a strategy in advance before the clock starts ticking! You have to start the level before the goals and resources appear at the top of the screen. So I have to start the clock before I can look at the goals and resources, look at the scene, and plan a strategy. As a result, I have to go ahead and start a level just to plan a strategy, then start the level over again in order to follow the strategy I've planned. It's so irritating, because in other TM games, and in the first version of this, the clock doesn't start ticking until I have a strategy in mind. It's still a fun game, but not as much fun as the first one because of these annoyances. Rated 3 out of 5 by grumpybear2252 from So great but over extremely quickly I loved this game so much that i played it twice in a row. Now considering that playing the entire game through twice back to back only took me four hours. I have to say that I am extremely dissapointed. I loved everything about this game other than the fact that the creators couldnt even make enough levels to keep me playing it for more than just past the trial period allows. I wish I hadn't wasted my money but then again it was fun to play. Felt like an extreme rush job level wise. Rated 3 out of 5 by urettini from Too Short and too easy I bought it but I really was hoping it would get more challenging in later levels. That never happened, the game play changed very little from beginning to end. I also noticed all the bad grammar, and a couple of times I had to restart the levels because some of the pips got stuck and couldn't finish their tasks.